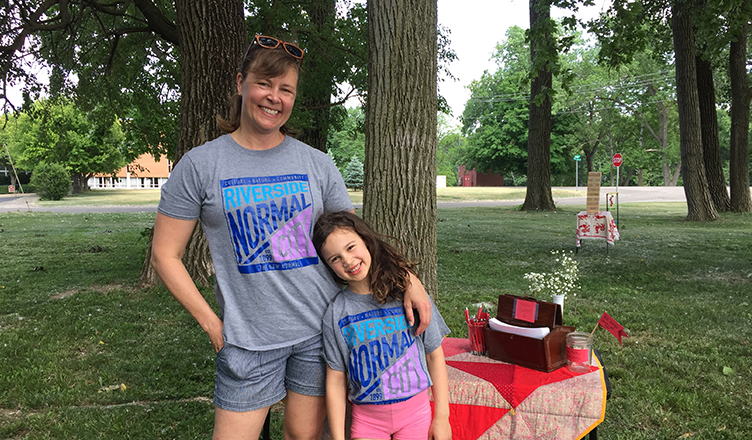 Photo: Riverside-Normal City residents Jen Erickson and her daughter Anika wearing their neighborhood t-shirts while setting up for the June 2nd RNC summer picnic. Muncie, IN is unique among many similar sized communities in the Midwest in that the city is largely broken into neighborhood associations that cover nearly the entire geographic span of the city. If you live within city limits, it’s likely that you live in a neighborhood and there’s a pretty good chance that that neighborhood has an association that meets regularly and is working to constantly improve the area in which you live. Muncie is also unique in that it has several local foundations who understand the importance of grassroots organizations working towards neighborhood revitalization and community building. Ball Brothers Foundation recently awarded a Rapid Grant to Muncie Action Plan to support these local efforts at the neighborhood level. A similar grant made to MAP in 2016 allowed the Old West End to purchase receptacles for pet waste for the two pocket parks that the neighborhood association installed and continue to manage in partnership with the City of Muncie Parks Department. Also utilizing these past project funds, the Riverside-Normal City Neighborhood Association was provided funding to purchase marketing materials, including t-shirts for residents and window clings that will be displayed in businesses located within the neighborhood. This type of branding helps increase awareness of the neighborhood association that will ultimately help connect students, residents, and businesses, creating a sense of community among neighbors. In 2018, Muncie will see projects pop-up in neighborhoods across the city and these projects will be resident driven and designed to meet the needs of the neighborhoods in which they are focused. Neighborhoods applying to MAP for these funds will need to meet basic requirements of an organized association and have resident buy-in in the project. But creativity is key, as associations can plan for projects that meet their individual needs. Neighborhoods interested in accessing these project funds should visit the Resources page. Applications will be accepted through July 9th with a funding announcement at the Neighborhood Leadership Council Pool Party at Tuhey Pool on July 17th.